Studies of the Earth's atmosphere have shown that more than 90% of the expected amount of Xe is depleted, a finding often referred to as the 'missing Xe paradox'. Although several models for a Xe reservoir have been proposed, whether the missing Xe could be contained in the Earth's inner core has not yet been answered. The key to addressing this issue lies in the reactivity of Xe with Fe/Ni, the main constituents of the Earth's core. Here, we predict, through first-principles calculations and unbiased structure searching techniques, a chemical reaction of Xe with Fe/Ni at the temperatures and pressures found in the Earth's core. We find that, under these conditions, Xe and Fe/Ni can form intermetallic compounds, of which XeFe3 and XeNi3 are energetically the most stable. This shows that the Earth's inner core is a natural reservoir for Xe storage and provides a solution to the missing Xe paradox. The research results have been published in Nature Commun. 5, 3666 (2014). 3. Pressure stabilization of long-missing bare C6 hexagonal rings in binary sesquicarbides. Carbon (C) is able to form various bonding patterns, including graphene sheets, chains and dimers, but stable bare six-membered C6 hexagonal rings, which are the fundamental structural motifs of graphite and graphene have long been missing. Here we report the stabilization of such bare C6 rings under high pressures in the charge-transfer systems of binary sesquicarbides Y2C3 and La2C3 as predicted by first-principles swarm structure searching simulations. We found that the external pressure can be used to efficiently tune structural transitions in the sesquicarbides from the ambient-pressure cubic phases into high-pressure orthorhombic phases, accompanied by significant C�CC bonding modification from C�CC dimers to bare C6 rings and polymerized graphene-like double C6 sheets. The bare C6 rings are stabilized in Y2C3 and La2C3 at pressures above 32 and 13 GPa, respectively, which are readily accessible to experiments. Chemical bonding analysis reveals that the bare C6 rings feature a benzene-like sp2 C�CC bonding pattern with a delocalized π system. Y or La → C charge transfer and the need for denser structure packing are found to be part of the underlying mechanisms behind the stabilization of the bare C6 rings. The research results have been published in Chem. Sci. 5, 3936 (2014). Tungsten borides are among a distinct class of transition-metal light-element compounds with superior mechanical properties that rival those of traditional superhard materials. An in-depth understanding of these compounds, however, has been impeded by uncertainties regarding their complex crystal structures. Here, we examine a wide range of chemical compositions of tungsten borides using a recently developed global structural optimization approach. We establish thermodynamically stable structures and identify a large number of metastable phases. These results clarify and correct previous structural assignments and predict new structures for possible synthesis. Our findings provide crucial insights for understanding the rich and complex crystal structures of tungsten borides, which have broad implications for further exploration of this class of promising materials. The research results have been published in Phys. Rev. Lett. 110, 136403 (2013). The recent discovery of phase IV of solid hydrogen and deuterium consisting of two alternate layers of graphenelike three-molecule rings and unbound H2 molecules have generated great interest. However, the vibrational nature of phase IV remains poorly understood. Here, we report a peculiar proton or deuteron transfer and a simultaneous rotation of three-molecule rings in graphenelike layers predicted by ab initio variable-cell molecular dynamics simulations for phase IV of solid hydrogen and deuterium at pressure ranges of 250�C350 GPa and temperature range of 300�C500 K. This proton or deuteron transfer is intimately related to the particular elongation of molecules in graphenelike layers, and it becomes more pronounced with increasing pressure at the course of larger elongation of molecules. As the consequence of proton transfer, hydrogen molecules in graphenelike layers are short lived and hydrogen vibration is strongly anharmonic. Our findings provide direct explanations on the observed abrupt increase of Raman width at the formation of phase IV and its large increase with pressure. The research results have been published in Phys. Rev. Lett. 110, 025903 (2013). High pressure can fundamentally alter the bonding patterns of light elements and their compounds, leading to the unexpected formation of materials with unusual chemical and physical properties. Using an unbiased structure search method based on particle swarm optimization algorithms in combination with density functional theory calculations, we investigate the phase stabilities and structural changes of various Li-B systems on the Li-rich regime under high pressures. We identify the formation of four stoichiometric lithium borides (Li3B2, Li2B, Li4B, and Li6B) having unforeseen structural features that might be experimentally synthesizable over a wide range of pressures. Strikingly, it is found that the B-B bonding patterns of these lithium borides evolve from graphite-like sheets in turn to zigzag chains, dimers, and eventually isolated B ions with increasing Li content. These intriguing B-B bonding features are chemically rationalized by the elevated B anionic charges as a result of Li->B charge transfer. The research results have been published in J. Am. Chem. Soc. 134, 18699 (2012). Under high pressure, triply bonded molecular nitrogen dissociates into singly bonded polymeric nitrogen, a potential high-energy-density material. The discovery of stable high-pressure forms of polymeric nitrogen is of great interest. 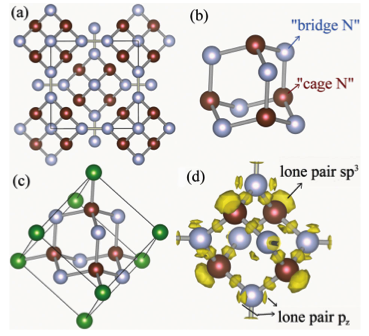 We report the striking stabilization of cagelike diamondoid nitrogen at high pressures predicted by first-principles structural searches. The diamondoid structure of polymeric nitrogen has not been seen in any other elements, and it adopts a highly symmetric body-centered cubic structure with lattice sites occupied by diamondoids, each of which consists of ten nitrogen atoms, forming a N10 tetracyclic cage. Diamondoid nitrogen possesses a wide energy gap and is energetically most stable among all known polymeric structures above 263 GPa, a pressure that is accessible to a high-pressure experiment. Our findings represent a significant step toward the understanding of the behavior of solid nitrogen at extreme conditions. The research results have been published in Phys. Rev. Lett. 109, 175502 (2012). 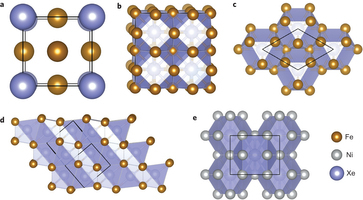 Hydrogen-rich compounds hold promise as high-temperature superconductors under high pressures. 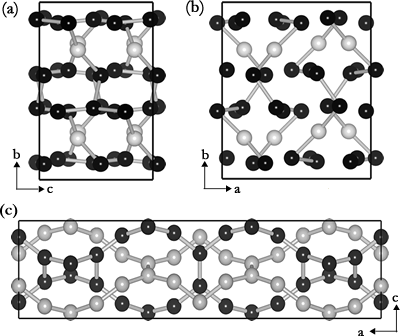 Recent theoretical hydride structures on achieving high-pressure superconductivity are composed mainly of H2 fragments. Through a systematic investigation of Ca hydrides with different hydrogen contents using particle swam optimization structural search, we show that in the stoichiometry CaH6 a body-centered cubic structure with hydrogen that forms unusual sodalite cages containing enclathrated Ca stabilizes above pressure 150 GPa. The stability of this structure is derived from the acceptance by two H2 of electrons donated by Ca forming an "H4" unit as the building block in the construction of the three-dimensional sodalite cage. This unique structure has a partial occupation of the degenerated orbitals at the zone center. The resultant dynamic Jahn-Teller effect helps to enhance electron-phonon coupling and leads to superconductivity of CaH6. A superconducting critical temperature (Tc) of 220-235 K at 150 GPa obtained from the solution of the Eliashberg equations is the highest among all hydrides studied thus far. The research results have been published in Proc. Natl. Acad. Sci. USA 109, 6463 (2012). Oxygen is in many ways a unique element: It is the only known diatomic molecular magnet, and it exhibits an unusual O8 cluster in its high-pressure solid phase. Pressure-induced molecular dissociation as one of the fundamental problems in physical sciences has been reported from theoretical or experimental studies of diatomic solids H2, N2, F2, Cl2, Br2, and I2 but remains elusive for molecular oxygen. We report here the prediction of the dissociation of molecular oxygen into a polymeric spiral chain O4 structure (space group I41/acd, θ-O4) above 1.92-TPa pressure using the particle-swarm search method. The θ-O4 phase has a similar structure as the high-pressure phase III of sulfur. The molecular bonding in the insulating ε-O8 phase or the isostructural superconducting ζ-O8 phase remains remarkably stable over a large pressure range of 0.008-1.92 TPa. The pressure-induced softening of a transverse acoustic phonon mode at the zone boundary V point of O8 phase might be the ultimate driving force for the formation of θ-O4. Stabilization of θ-O4 turns oxygen from a superconductor into an insulator by opening a wide band gap (approximately 5.9 eV) that originates from the sp3-like hybridized orbitals of oxygen and the localization of valence electrons. The research results have been published in Proc. Natl. Acad. Sci. USA 109, 751 (2012). Water ice dissociates into a superionic solid at high temperature (>2,000 K) and pressure, where oxygen forms the lattice, but hydrogen diffuses completely. At low temperature, however, the dissociation into an ionic ice of hydronium (H3O)+ hydroxide (OH)- is not expected because of the extremely high energy cost (~1.5 eV) of proton transfer between H2O molecules. Here we show the pressure-induced formation of a partially ionic phase (monoclinic P21 structure) consisting of coupled alternate layers of (OH)δ- and (H3O)δ+ (δ=0.62) in water ice predicted by particle-swarm optimization structural search at zero temperature and pressures of >14 Mbar. The occurrence of this ionic phase follows the break-up of the typical O-H covalently bonded tetrahedrons in the hydrogen symmetric atomic phases and is originated from the volume reduction favourable for a denser structure packing. The research results have been published in Nature Commun. 2, 563 (2011). Being a best known thermoelectric material and a topological insulator at ambient condition, magic bismuth telluride (Bi2Te3) under pressure transforms into several superconducting phases, whose structures remain unsolved for decades. Here, we have solved the two long-puzzling low high-pressure phases as seven- and eightfold monoclinic structures, respectively, through particle-swarm optimization technique on crystal structure prediction. 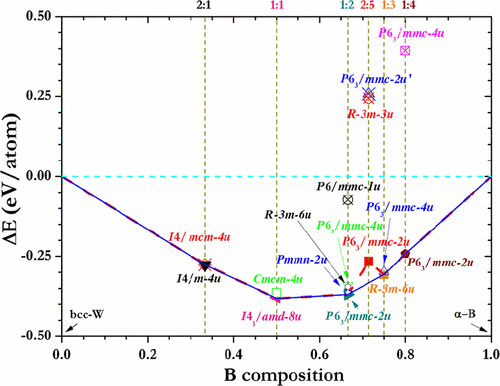 Above 14.4 GPa, we experimentally discovered that Bi2Te3 unexpectedly develops into a Bi-Te substitutional alloy by adopting a body-centered cubic disordered structure stable at least up to 52.1 GPa. The continuously monoclinic distortion leads to the ultimate formation of the Bi-Te alloy, which is attributed to the Bi-Te charge transfer under pressure. Our research provides a route to find alloys made of nonmetallic elements for a variety of applications. The research results have been published in Phys. Rev. Lett. 106, 145501 (2011). 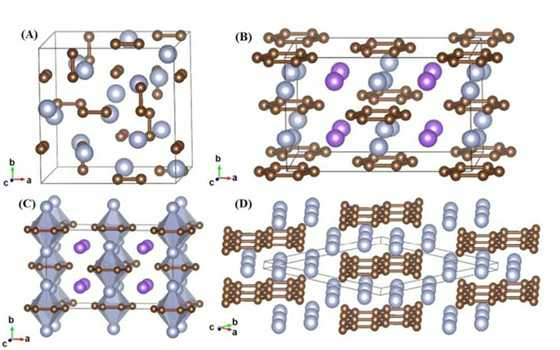 Under high pressure, simple lithium (Li) exhibits complex structural behavior, and even experiences an unusual metal-to-semiconductor transition, leading to topics of interest in the structural polymorphs of dense Li. We here report two unexpected orthorhombic high-pressure structures Aba2-40 (40 atoms=cell, stable at 60-80 GPa) and Cmca-56 (56 atoms=cell, stable at 185-269 GPa), by using a newly developed particle swarm optimization technique on crystal structure prediction. The Aba2-40 having complex 4- and 8-atom layers stacked along the b axis is a semiconductor with a pronounced band gap >0.8 eV at 70 GPa originating from the core expulsion and localization of valence electrons in the voids of a crystal. We predict that a local trigonal planar structural motif adopted by Cmca-56 exists in a wide pressure range of 85? ?C434 GPa, favorable for the weak metallicity. The research results have been published in Phys. Rev. Lett. 106, 015503 (2011). 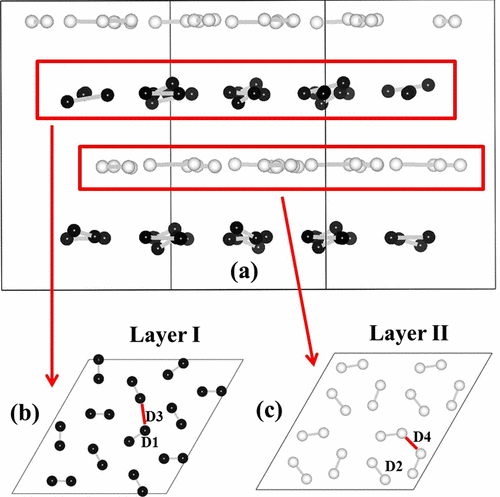 We have developed a method for crystal structure prediction from ?0?3??scratch?0?3?? through particle swarm optimization (PSO) algorithm within the evolutionary scheme. PSO technique is different with the genetic algorithm and has apparently avoided the use of evolution operators (e.g., crossover and mutation). The approach is based on an efficient global minimization of free energy surfaces merging total-energy calculations via PSO technique and requires only chemical compositions for a given compound to predict stable or metastable structures at given external conditions (e.g., pressure). A particularly devised geometrical structure parameter which allows the elimination of similar structures during structure evolution was implemented to enhance the structure search efficiency. The application of designed variable unit cell size technique has greatly reduced the computational cost. Moreover, the symmetry constraint imposed in the structure generation enables the realization of diverse structures, leads to significantly reduced search space and optimization variables, and thus fastens the global structure convergence. The PSO algorithm has been successfully applied to the prediction of many known systems (e.g., elemental, binary and ternary compounds) with various chemical bonding environments (e.g., metallic, ionic, and covalent bonding). 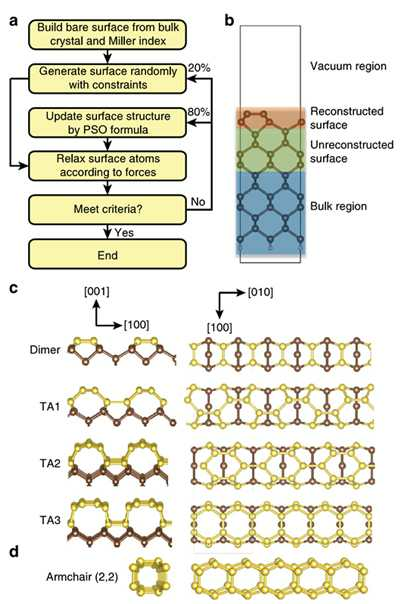 The high success rate demonstrates the reliability of this methodology and illustrates the promise of PSO as a major technique on crystal structure determination. The research results have been published in Phys. Rev. B 82, 094116 (2010).